William Paxton, born August 5, 1930 in Lewiston, was one of Maine’s top selling artists. He had a passion for painting and from a young age he was known for his talents in sketching. 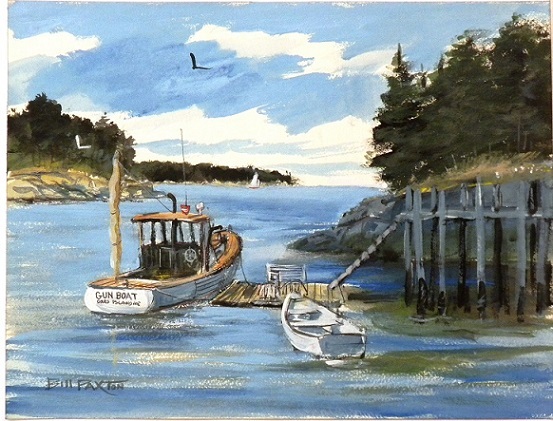 Paxton captured many popular Maine scenes with watercolor, acrylic, and oils. His work also includes historical scenes he referenced in books from as early as the 1920’s, painting locomotives, aircraft, and war scenes. Paxton’s art is sold all over the world. As a student at Bridgton Academy, he was featured in his yearbook. It states, “When artist Bill picks up his pen, we all stand at attention, for his remarks and pictures are certainly worth mention.” He wanted to pursue a career selling his art, but it was during the time of the Great Depression. Also in his younger years, Paxton had an interest in skiing and won a medal for Second Highest Ski Jump. From there he went to flying and received a certification for Second-in-Command, to fly alongside the captain in a C-46F type of aircraft. He then joined the Air Force in the 40’s, although his passion and talents for art were constant throughout his life. Paxton quickly became the front line military sketch artist. He was a draftsman for the 14th Air Force in the Management Analysis section, holding a position at Robins Air Force Base in Warner Robins, GA. for 22 years. In his spare time, Paxton also did humorous cartoon sketches about Air Force and civilian life. Some of his paintings are now hanging on the walls of the Pentagon in Washington D.C.
Paxton retired in Maine after his service. He was content living a somewhat hermit-like existence. His passion for art continued with vigor until poor health prevented him from painting.